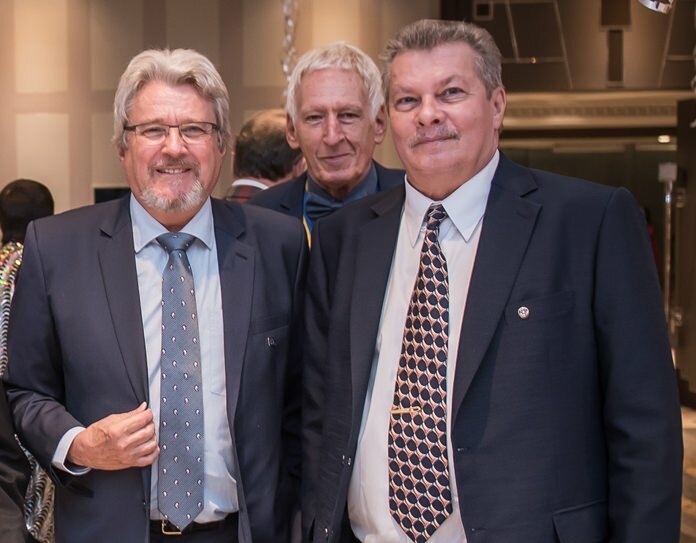 Jan Abbink, Carl Dyson and Pres. 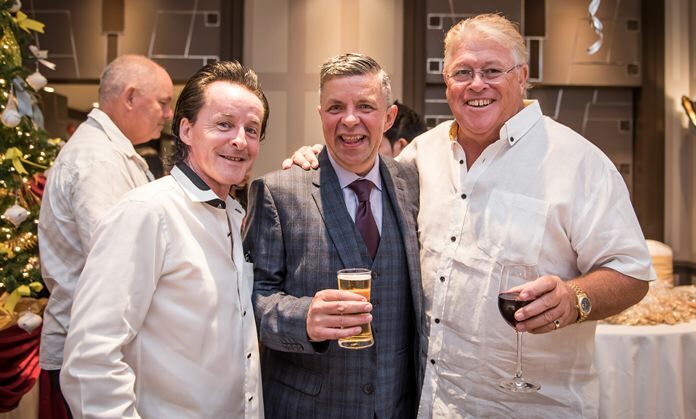 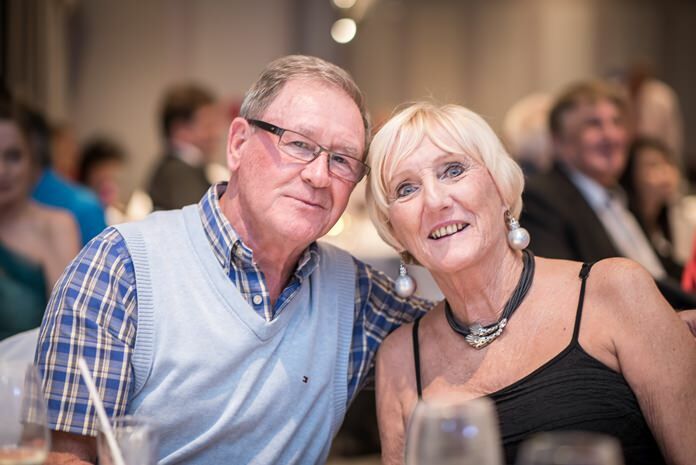 Brian Songhurst worked exceptionally hard to make this event a roaring success. 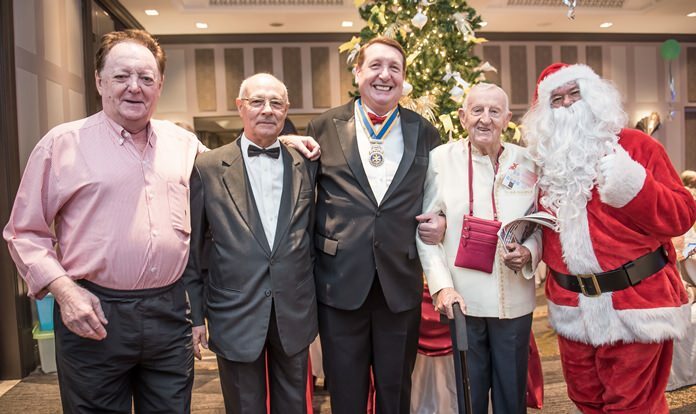 More than 160 Rotarians and their friends celebrated the holidays at the Rotary Club of the Eastern Seaboard’s annual Christmas party. 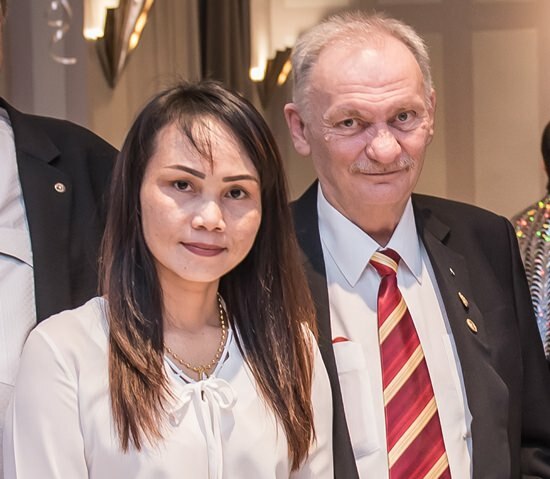 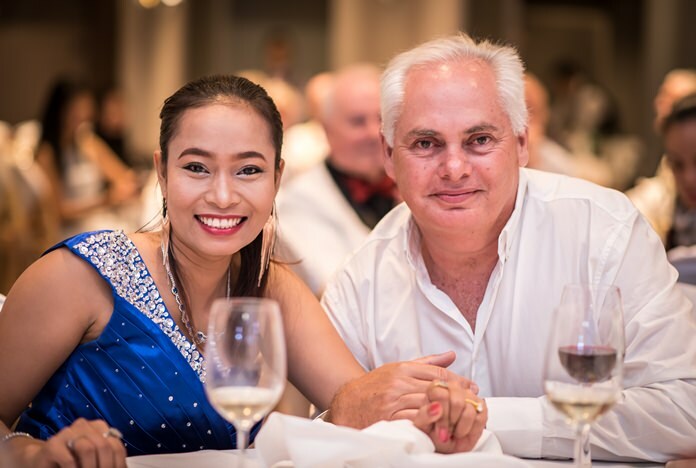 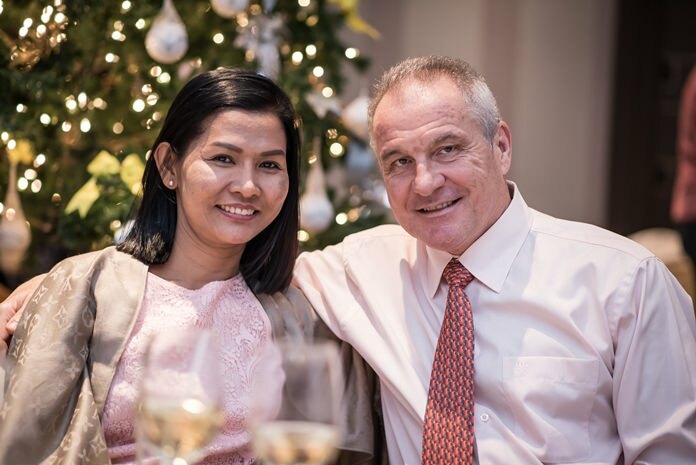 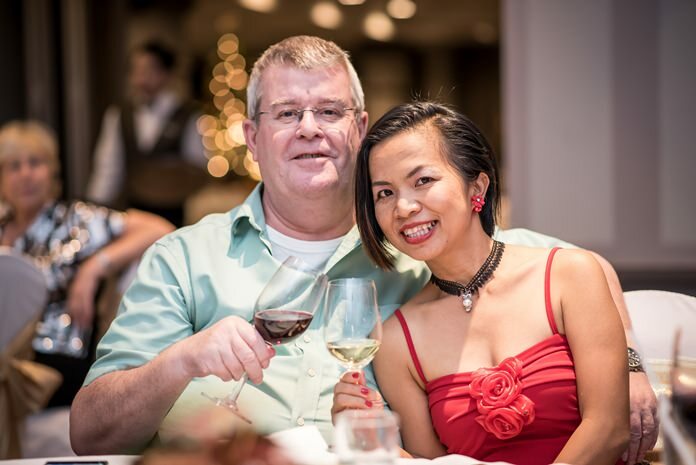 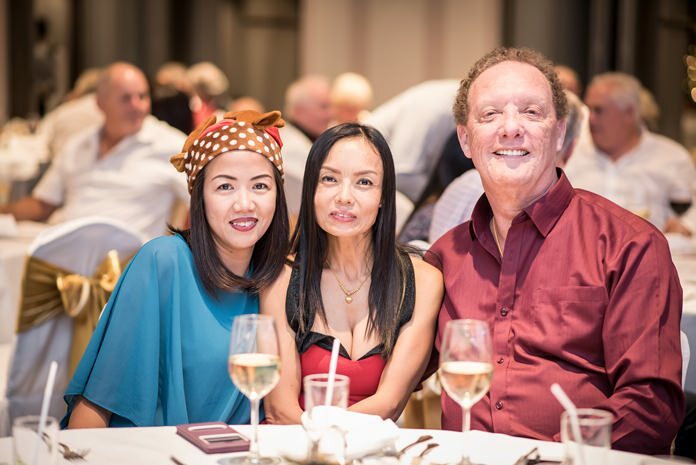 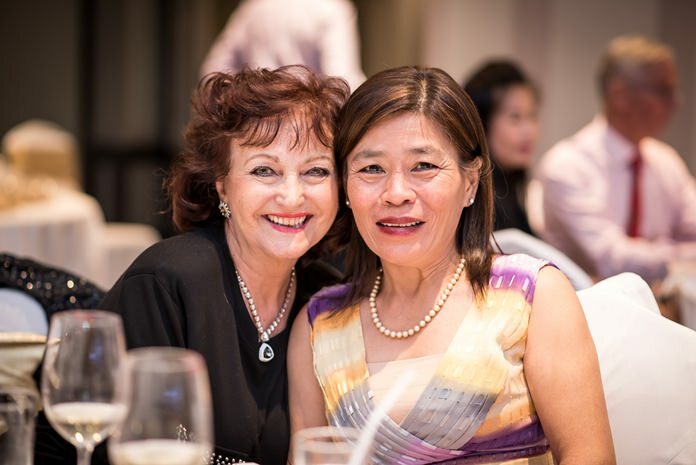 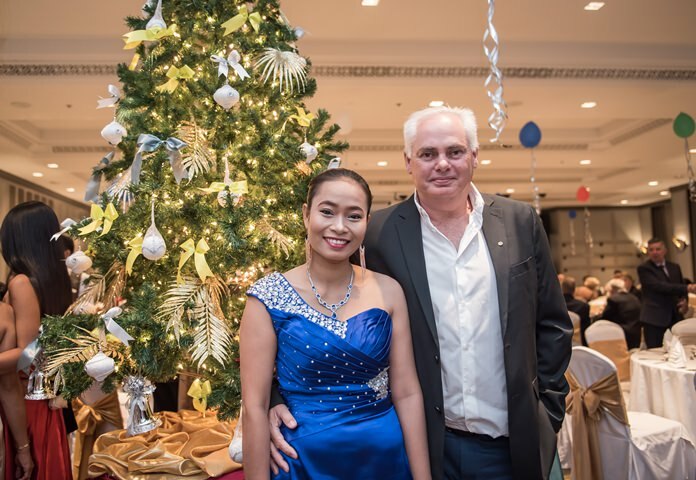 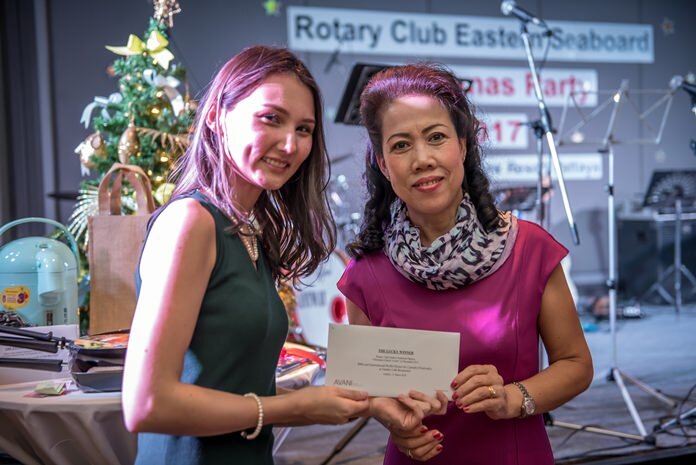 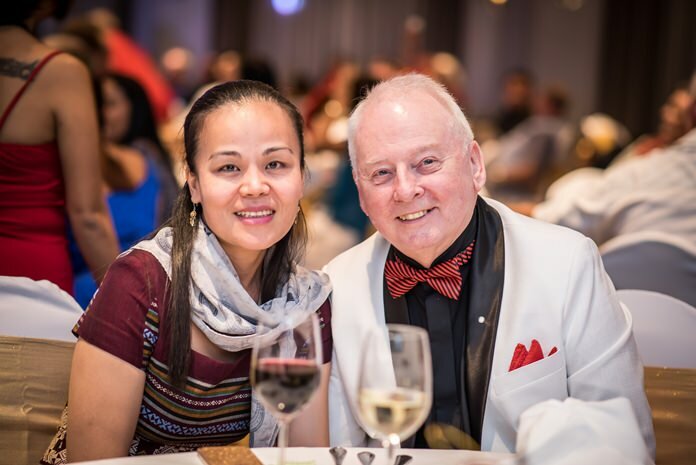 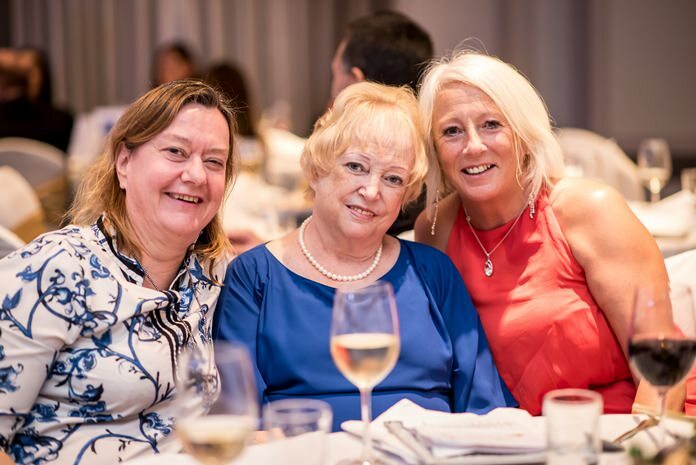 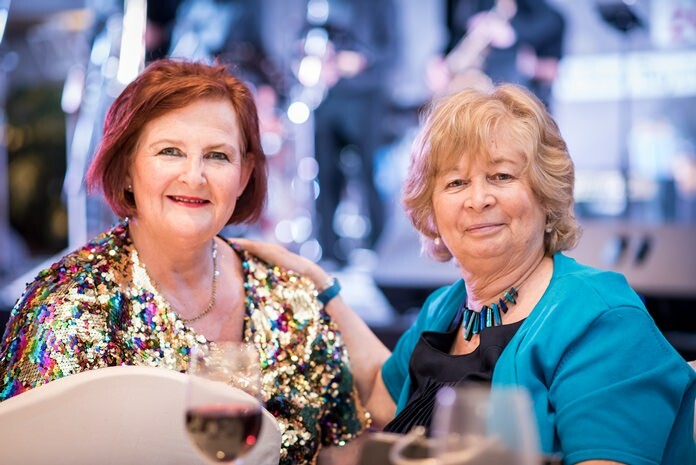 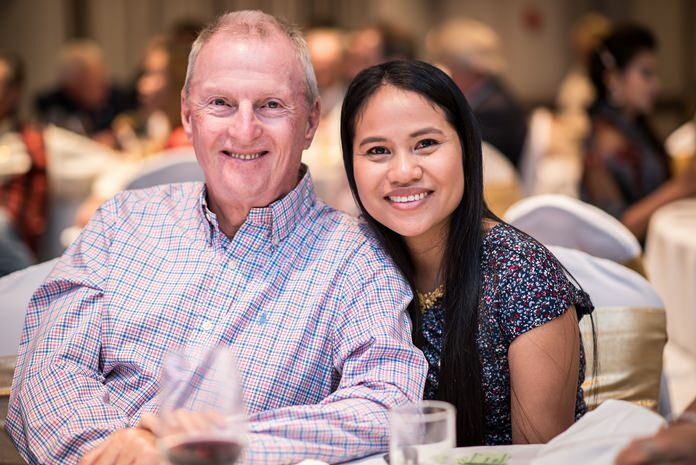 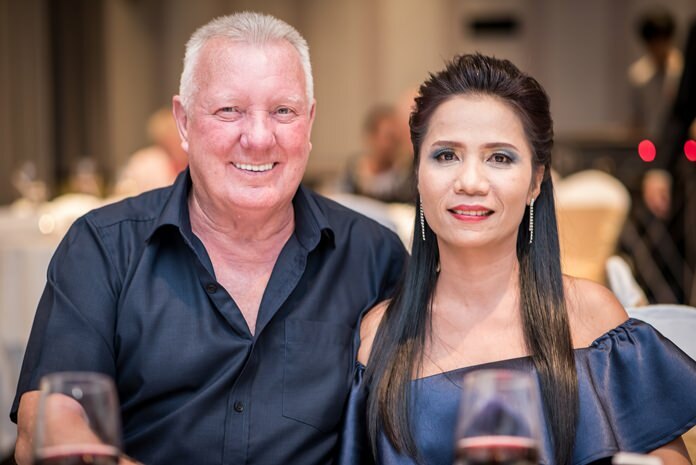 The Dec. 21 celebration at the Siam Bayshore Resort was packed with Rotarians, members of the Pattaya International Ladies Club, brethren of Lodge Pattaya West Winds and more. 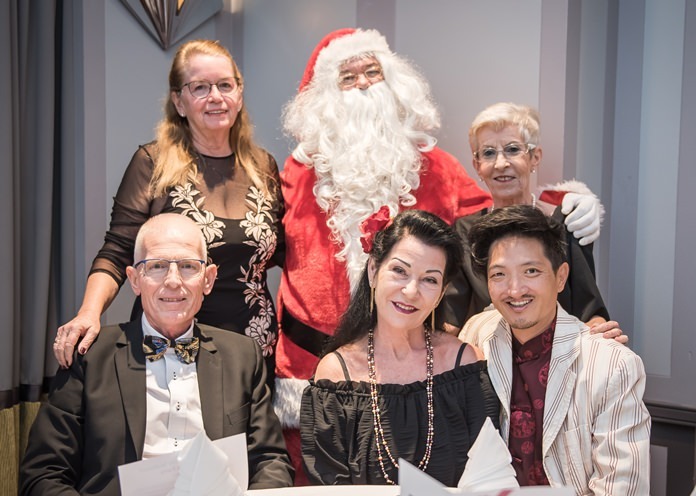 Santa Claus greeted everyone at the door and posed for photos. 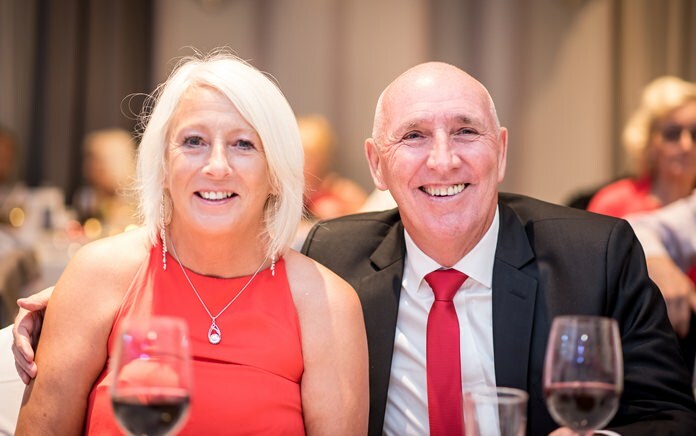 President Brian Songhurst opened the event, making a formal speech and brief overview of the many projects that the club had implemented in the past year, and thanked members and sponsors for their continued support. 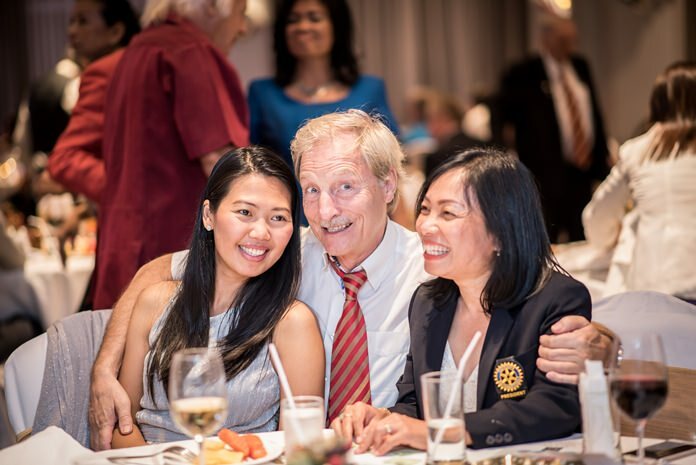 Past President Jan Abbink, the effervescent emcee introduced the guests, informed them about the activities that would take place and invited everyone to partake in the sumptuous feast. 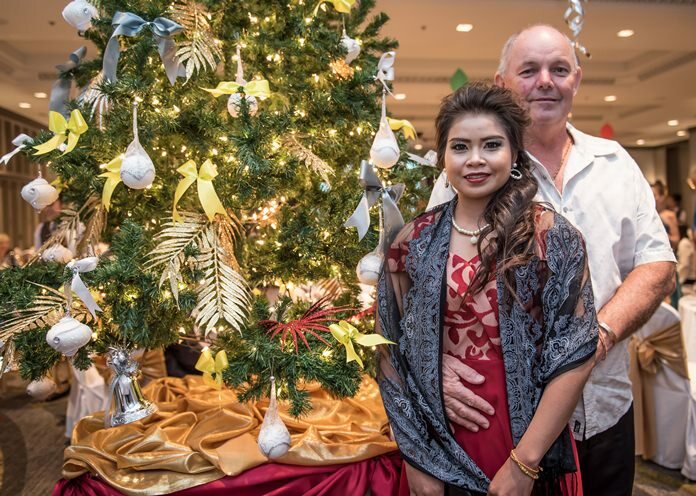 The Siam Bayshore buffet featured a variety of cuisines for everybody, including honey glazed ham, turkey, sushi, and free flow drinks throughout the night. 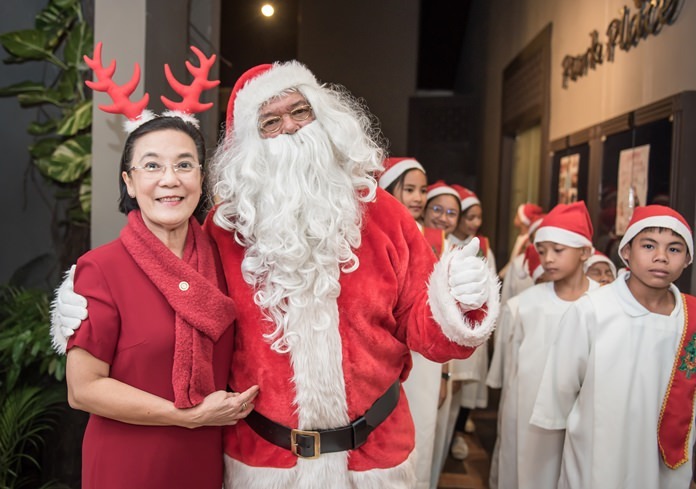 Radchada Chomjinda, director of the Human Help Network Foundation Thailand led her children in singing Christmas carols and other favorite festive songs. 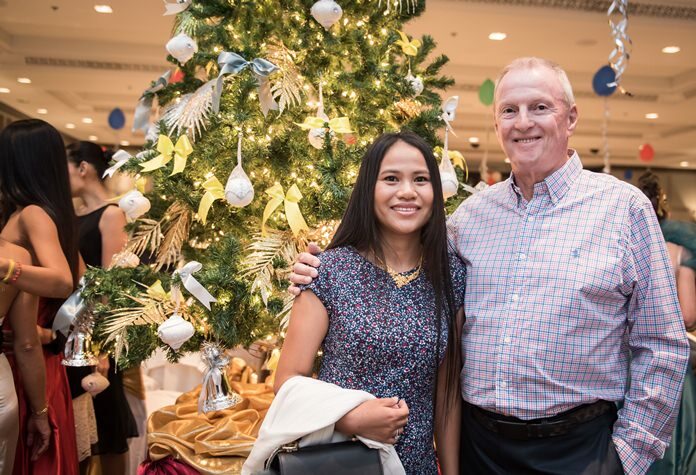 Santa Claus and Brian Songhurst rewarded the talented children with Christmas bags full of goodies. 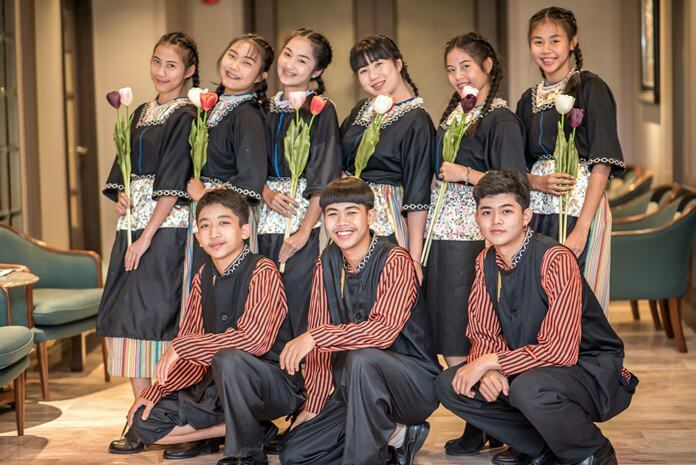 They were followed by the talented Siam Bayshore singers and dancers which was a lot of fun to watch. 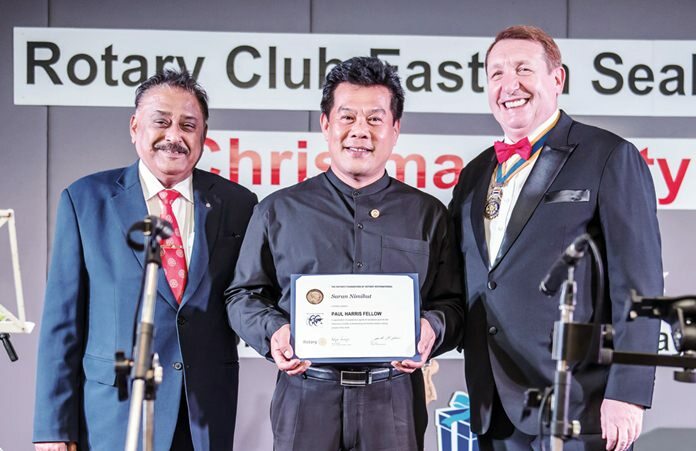 During the course of the evening Regional General Manager Saran Nimitz was called up to be recognized as a Paul Harris Fellow, Rotary’s highest award for a person’s contributions to humanity. 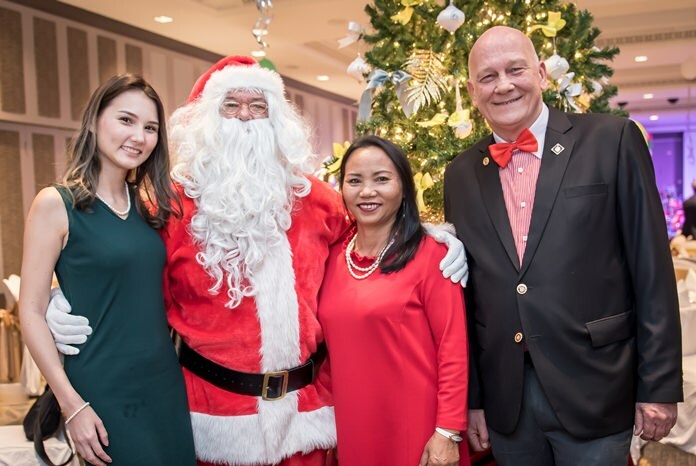 Santa Claus welcomes Radchada Chomjinda ‘Toy’ and her children to the Christmas festivities. 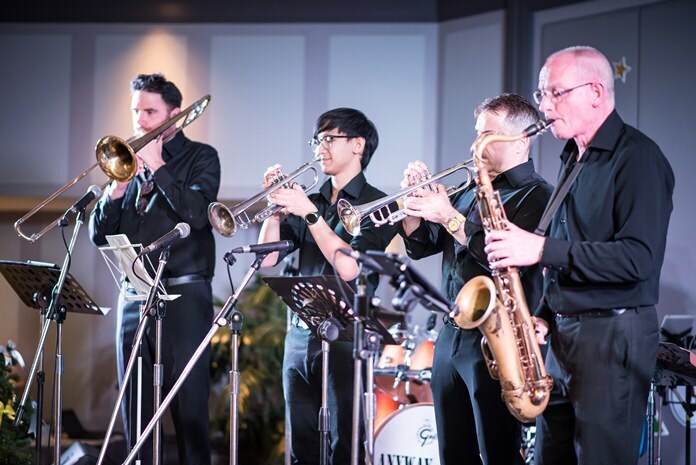 The highlight of evening was the tremendous performance by ‘B2F Big to the Future’, a “small” big band from the Netherlands, which is currently touring Thailand. 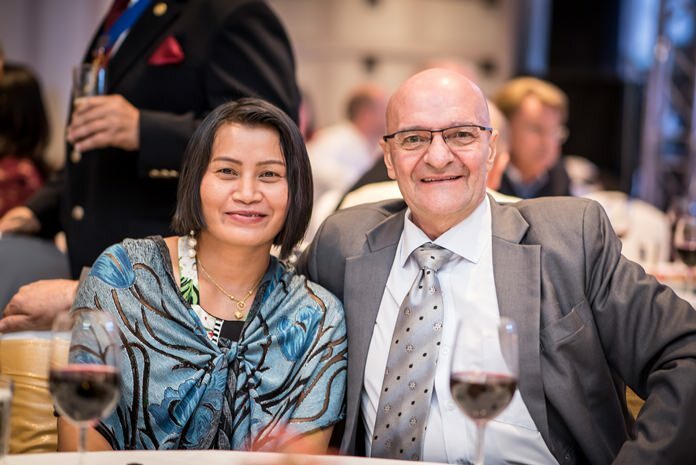 Saran Nimihut joins the ranks of distinguished persons around the world who are recognized as a Paul Harris Fellow. 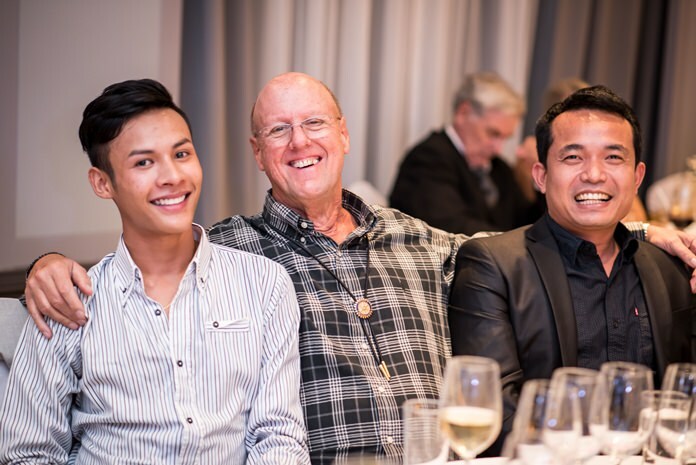 He is flanked by PDG Peter Malhotra and President Brian Songhurst. 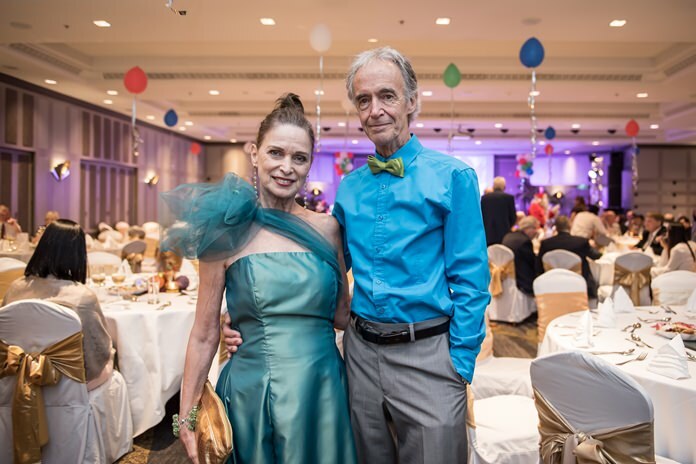 This year the theme was “duets” so founding members Jos Muijtjens and Paul van Duyn and the band were joined by female vocalist Merel Brusselers and male vocalist Erik Moonen. 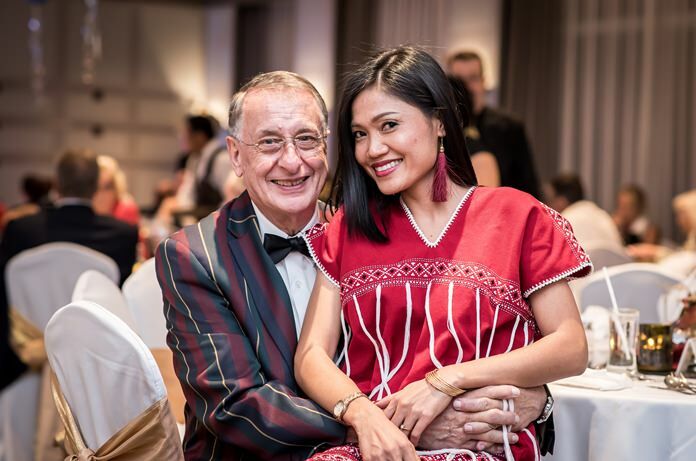 In memory of RCES Charter President Martin Brands, who passed away earlier this year, B2F played “Tulips from Amsterdam” (“Tulpen van Amsterdam”) with Merel singing in Dutch while Past President Rodney Charman wearing Dutch clogs sang the verses in English with children dancing along in traditional Dutch costumes. 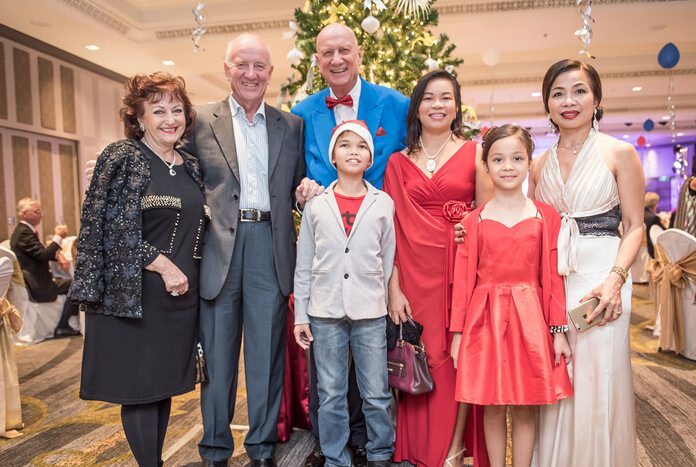 These children performed the ‘Tulpen van Amsterdam’ dance magnificently. 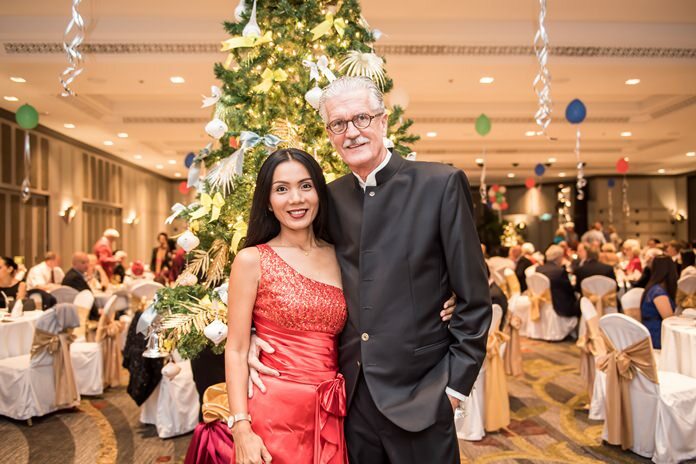 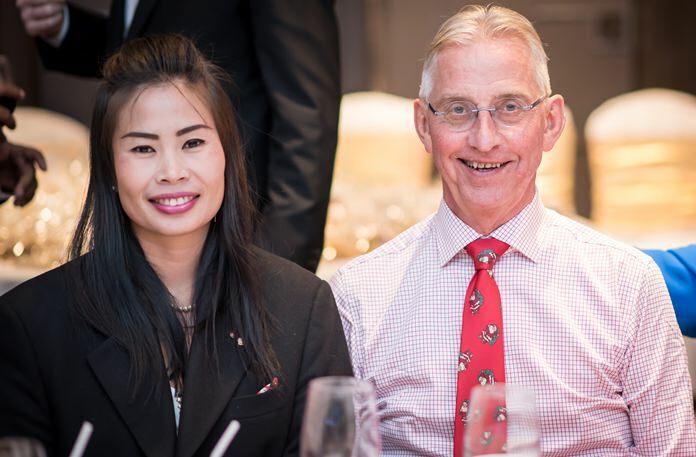 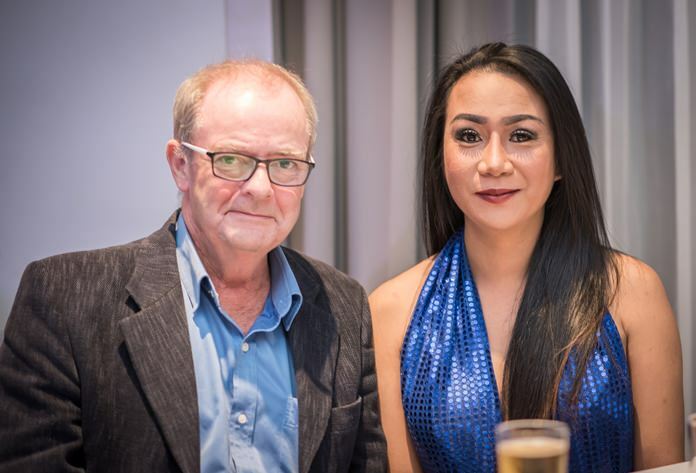 President Carl R. Dyson conducted the draw of the raffle prizes which raised a handsome sum of close to 60,000 baht. 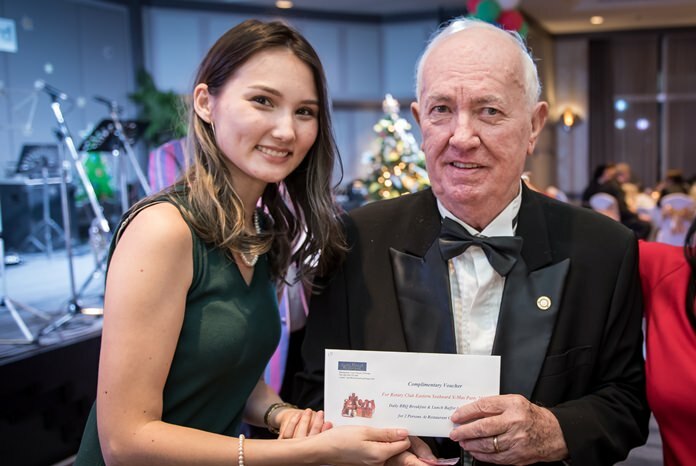 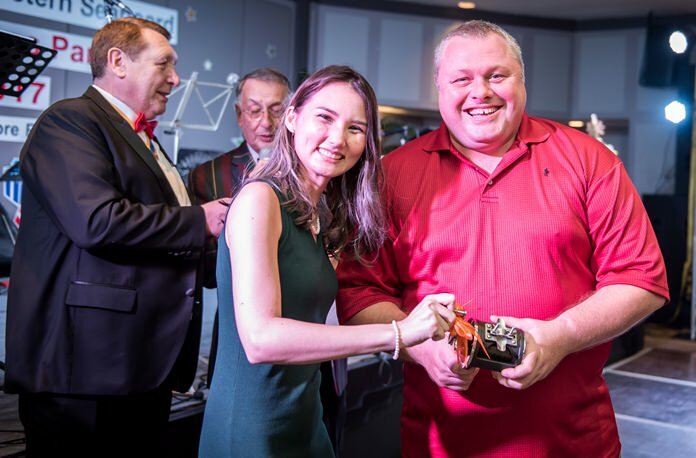 The winners were called to the front of the stage to collect their prizes, which ranged from hotel vouchers with accommodation packages to dinner vouchers and many other donated items. 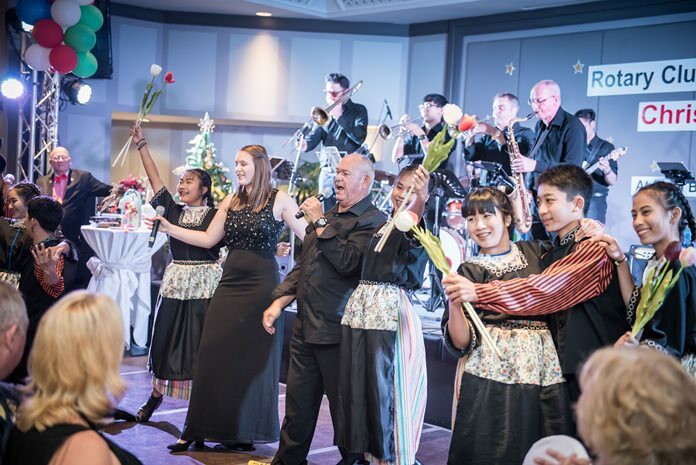 Merel Brusselers and Rodney Chapman sing ‘Tulips from Amsterdam’ in Dutch and English as the children dance in honour of the late Martin Brands. 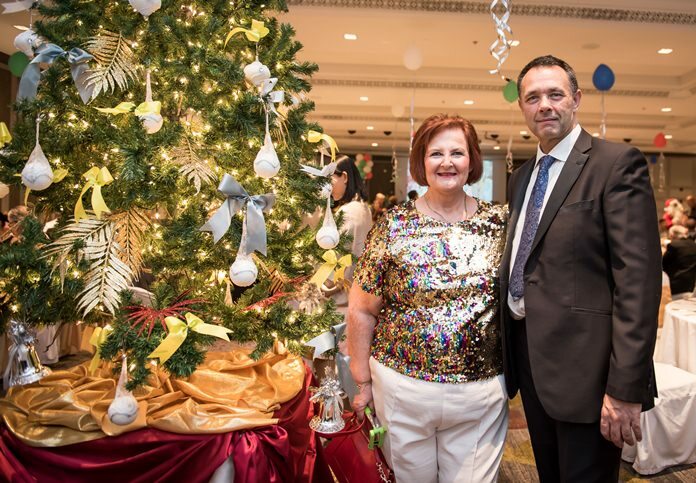 Rotarians together with their families and friends celebrate the season of peace and goodwill.